Duluth, MN, has always been a favorite destination for Minnesota tourists, vacationers, and explorers. It’s a beautiful, scenic city with steep hills reminiscent of San Francisco and views of Lake Superior that give the city a coastal feeling. I have always considered Duluth the coolest town in our state, and recent back-to-back weekends there only confirm this. 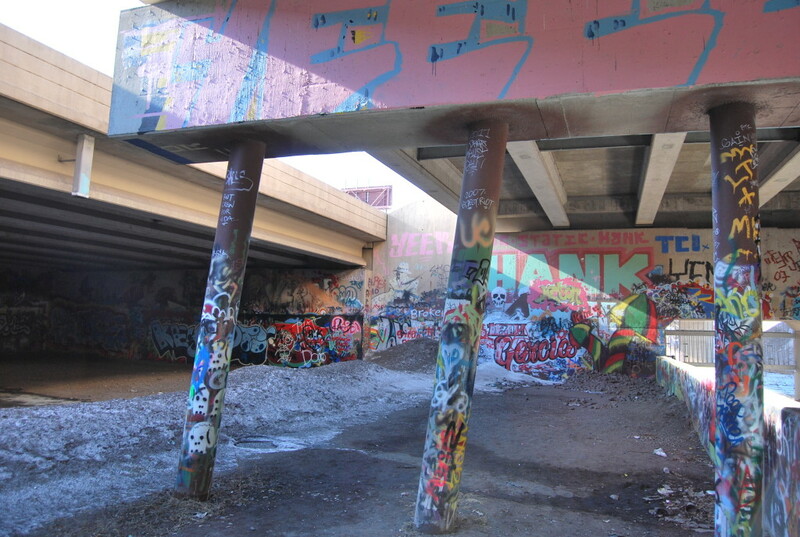 And while in Duluth, the obvious choices for sightseeing are things like Canal Park, the Lift Bridge, or the historic downtown area, there is a beautiful art gallery of sorts, only available to the adventurous, hidden away beneath the rumbling interstate traffic of I-35. 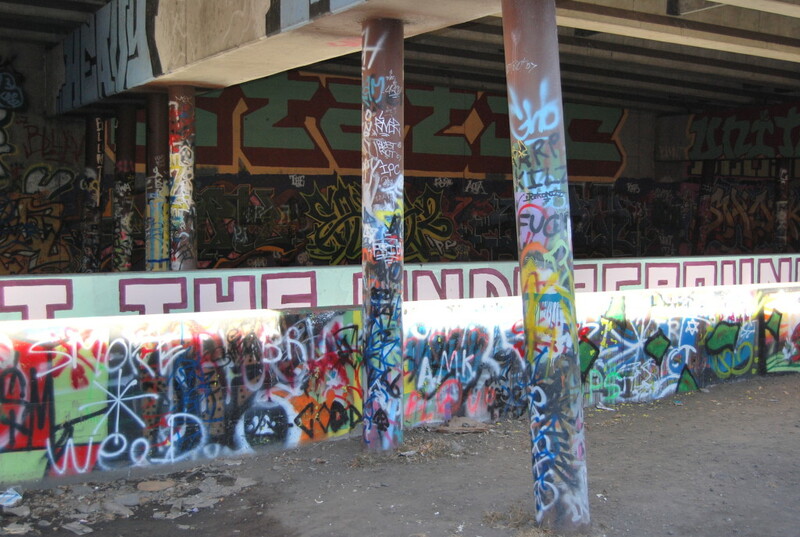 The Graffiti Graveyard is a great example of urban street art, located inside a quarter-mile stretch of subterranean concrete beneath the freeway, where vehicles blissfully pass by above, unaware of the artistic beauty that lies beneath. Both sides of the area are closed off, and the light from the gap between the two lanes of traffic pours into the middle of the room. 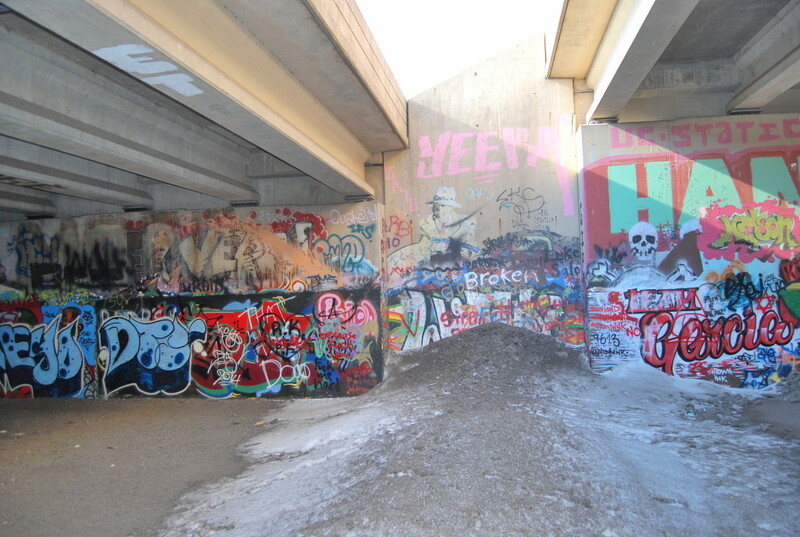 Here you will see the work of talented artists that have painted every corner, ledge, and pillar with colorful designs, slogans, pictures, and “tags.” This artists’ “sanctuary” is not visible whatsoever from anywhere in Duluth and only accessible by a small opening where a drainage canal flows through. The Graveyard is found by going on foot from downtown Duluth to the railroad tracks behind the old depot. You then must cross a small drainage river (which was frozen at our time of visit), and enter through a gate marked with a “No Trespassing” sign which is obviously ignored by all. Then you climb a small ledge to enter the long passageway. It’s a sketchy area to say the least, but recent efforts to clean up the litter and homeless have been put into effect and it wasn’t terribly bad when we visited. Although I wouldn’t want to be there at night. 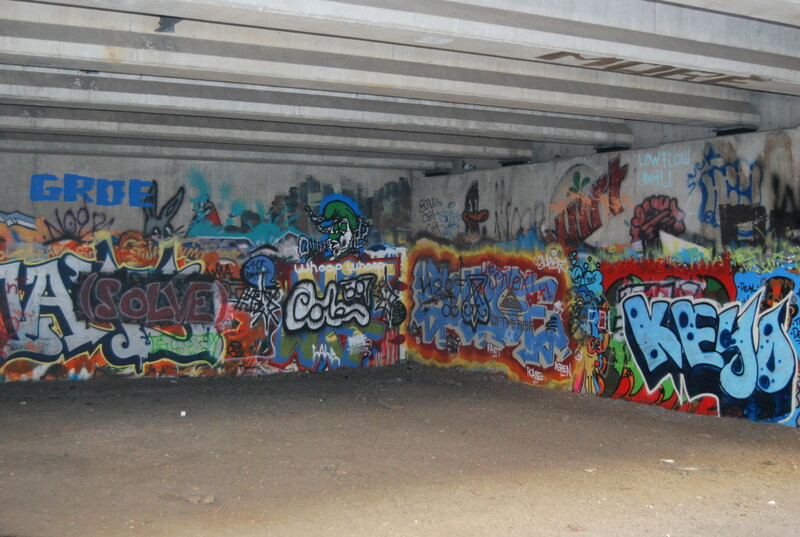 Graffiti art is something of an anomaly. It’s gotten a bad rap over the years due to it being so commonly associated with vandalism, but there is some real talent and creativity involved. 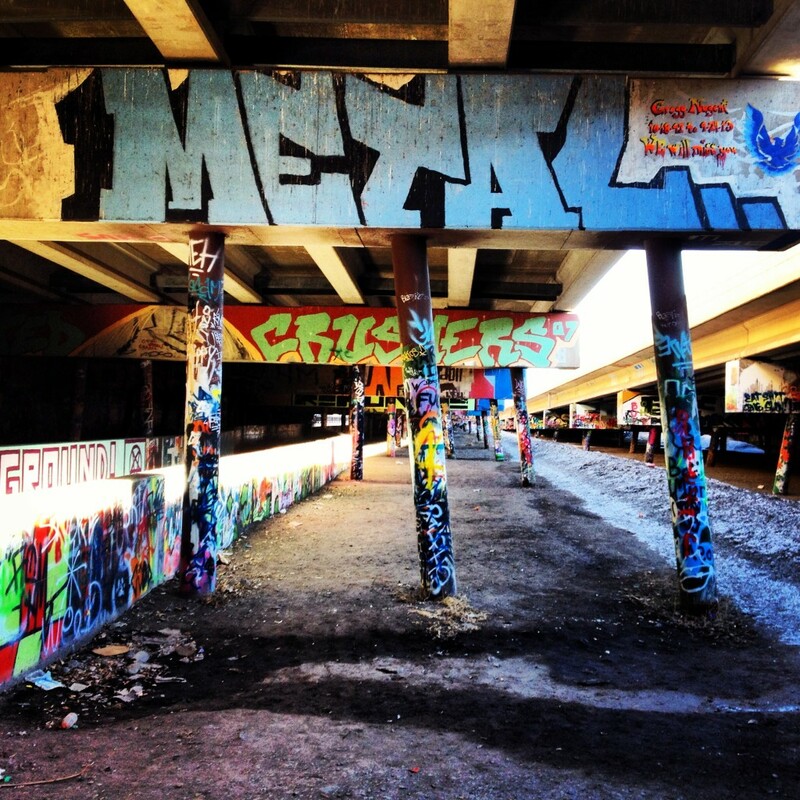 The Graffiti Graveyard seems to be a place where artists can show off their talents without breaking any major laws. But, since it is so unregulated, its fate is largely left to chance. There are reports of dubious activity and crime there in the past. 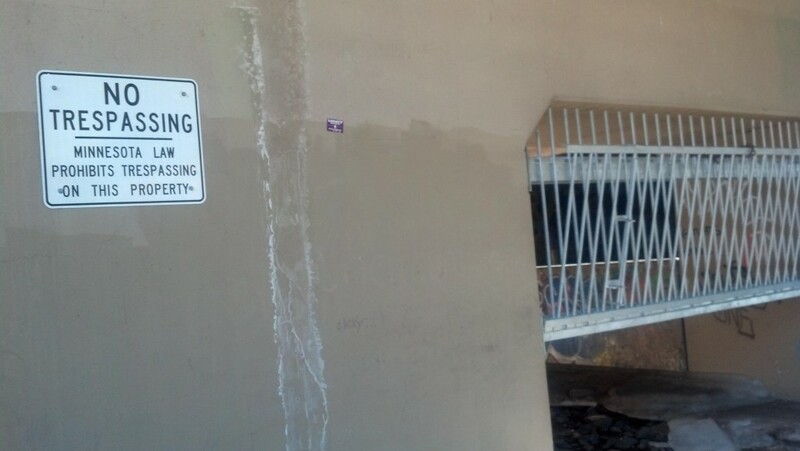 The city may decide to permanently clean it up and block off any entrances. They may decide to make a tourist attraction out of it, with admission and souvenirs. 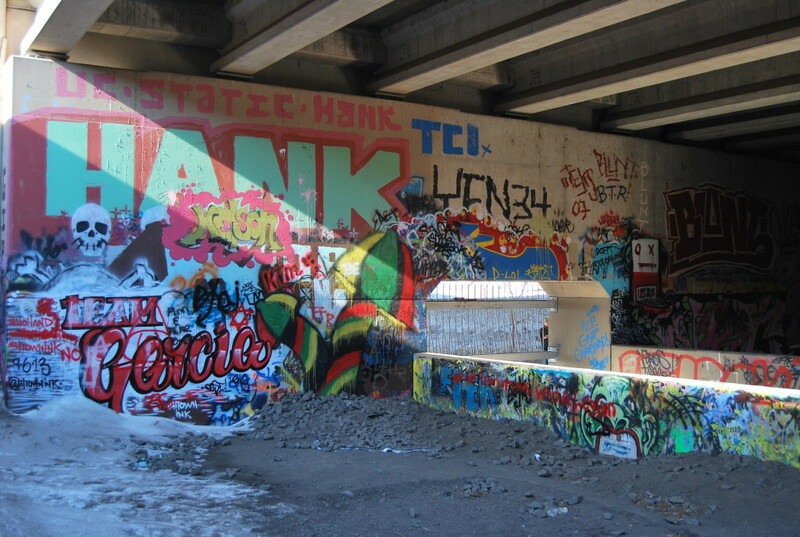 But we think that there is a part of the artsy, hippie lifestyle in Duluth that wants to leave the unspoken truce between street artists and city officials just the way it is. And we sure hope they do. While in the area: Exploring Minnesota’s North Shore is always fun, and Duluth is full of amazing architecture, cool museums, and touristy shops downtown and in Canal Park. Skip the Great Lakes Aquarium though. There are better things to see. “clean up the homeless”? Please. Suggest: “With Duluth being the first city in Minnesota to adopt a bill of rights for those who are homeless, fewer people, particularly families, are having to sleep in this area”.